A blinder of a concert. This tribute act (After Midnight) formed 28 years ago and this was their first time playing in Christchurch and only their second appearance in Dorset. 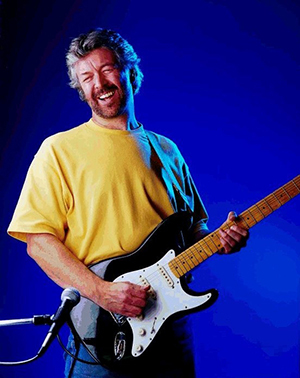 Lead guitarist/vocals Mike Hall has an uncanny resemblance to Clapton and has clearly studied the great man’s stance as well as his music. The band kicked off with ‘After Midnight’ (written by the late JJ Cale who died in July). The classics flowed like a river: ‘Lay Down Sally, ‘While My Guitar Gently Weeps’, ‘I Feel Free,’ ‘Little Wing,’ Wonderful Tonight’. Superb and seemingly effortless guitar playing, great harmonies and an appreciative full house made this an evening of solid sound to remember. Mike and the band: Dave Robson (bass/vocals), Paul Warren (keyboards) and Danny Davison (drums) produced an epic play out of ‘White Room’ (Cream) to end the first half. The best of the best continued through the second set, ‘I Shot the Sheriff,’ ‘Cocaine,’ ‘Sunshine of Your Love,’ ‘Promises,’ and an audience who proved they could sing a good chorus line too. As the end approached, my only seed of doubt was whether or not they could pull off the all time great ‘Layla,’ but their version was slick. A couple of encores later and the show was over. The gig seemed to pass in a flash. Mike has a friendly and inclusive manner and gave a number of shout outs to his fans, including Andrew – a fan for the last 23 years; Gary Theobald from the Regent Centre; and to my great surprise Janine Pulford (yes, me) the editor of mags4dorset got a shout out too. Thanks Mike! He also took time out to meet his fans after the show. Looking forward to meeting up with Mike and the band at The Stables, Wavendon and again at Clacton on Sea. Each time l see them l’m sure they are better than the time before. Close your eyes and listen, it’s difficult to tell Mike from Eric! Classic Clapton is just the best been a fan best part of ten years keep it going Mike.